The CoolCube bench top portable microtube or microplate cooler is constructed with a proprietary gel refrigerant. Place the CoolCube in a freezer overnight and it is ready for use, maintaining a temperature of approximately 0°C for up to four hours. For use while working on a laboratory bench or for short time transport. 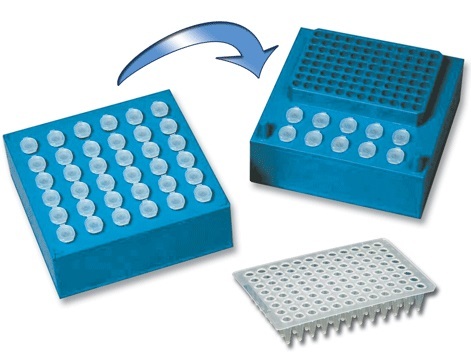 One side can be used as a PCR workstation, with wells for 10 standard 1.5/2.0 mL microtubes and one 96 well PCR plate or 0.2 mL tubes or strips. The other side can be used to hold 36 standard microtubes.